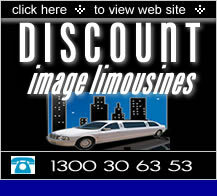 Servicing all South East Queensland including Brisbane, Gold Coast, Sunshine Coast, Byron Bay and Toowoomba. 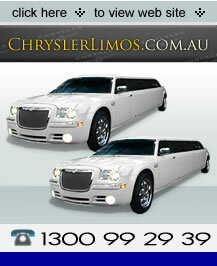 They all also offer a reliable & professional service. These services specialize in all aspects of quality transportation and strive to deliver the highest quality of service to all customers. 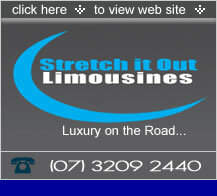 Choose any of these services to take the stress out of all your special occasion transportation needs, along with personal and professional service to accommodate all YOUR special needs. The vehicles offered here are not only great for that wonderful time out when you are going to concerts, dinners, theatre etc BUT they are the best for that special occasion like birthdays - wedding's - anniversary - proposal etc ....any special occasion. With a comprehensive range of 13, 11, 9 & 7 seat vehicles you are sure to find the size that you are after at the right price. All vehicles offered by these companies are ONLY new modern quality - NO old vehicles here ( this is important as vehicles NOT listed here may be up to 21 years old ) We only use new modern quality Australian vehicles. The chauffeurs have been screened & trained to be the best in the industry, along with being friendly, professional & courteous . All of these chauffeurs are fully uniformed in full black suit, white shirt & tie. Looking for help on your wedding day? Check out this helpful site..
Each of these items are required to provide an ACCURATE quote, as each quote is based on exactly WHAT YOU REQUIRE AND REQUEST- not a hourly rate – but as YOU request. Remember, each company is here to help you. Accurate details initially will ensure each company provides the quality of service you deserve. If you can supply accurate info - you shall receive accurate availability and price.